After all the money you spent replacing or repairing your roof, you probably would be disappointed if you walked outside and saw unsightly water stains growing on top of it. 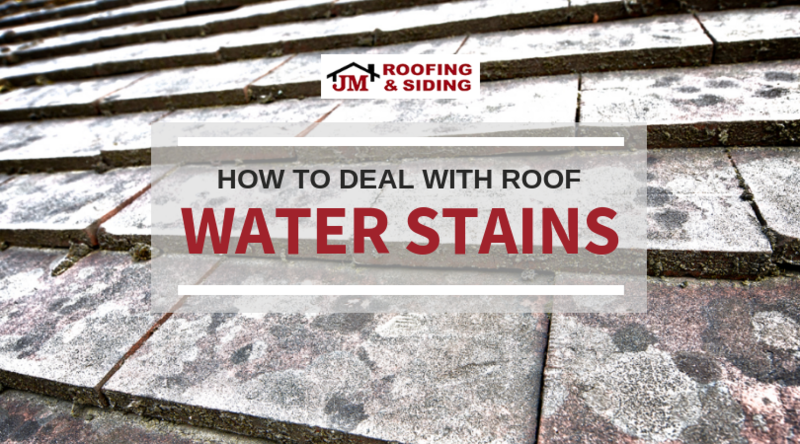 While any roof water stain is not ideal, you should be aware of which ones are worse for your roof’s integrity and how to deal with those stains. The stains are more likely to be found on your ceilings inside your home than they are on your roof itself. Yellow or white-ish stains are often a sign of water damage caused by a leak in your roof. You first move here should be to diagnose where your roof is leaking and have that repaired. To get rid of the yellow or white stains, your best bet is to use a vinegar solution to slowly fade them away. Scrubbing the stains could actually result in more damage. Black stains on your roof itself are usually a sign of algae growth. Algae can grow on your roof if it’s holding on to excess moisture and the sun beats down on it to help it grow. If you’re finding black stains on your ceiling, this is typically a sign of mold growth caused by excess moisture from a leaking roof. A professional roof cleaning should get rid of the algae on your roof. You should have the mold under ceiling inspected and removed by a professional in order to keep your home and family safe. For all your roofing needs in Norwalk, CT, trust the experts at JM Roofing and Siding!